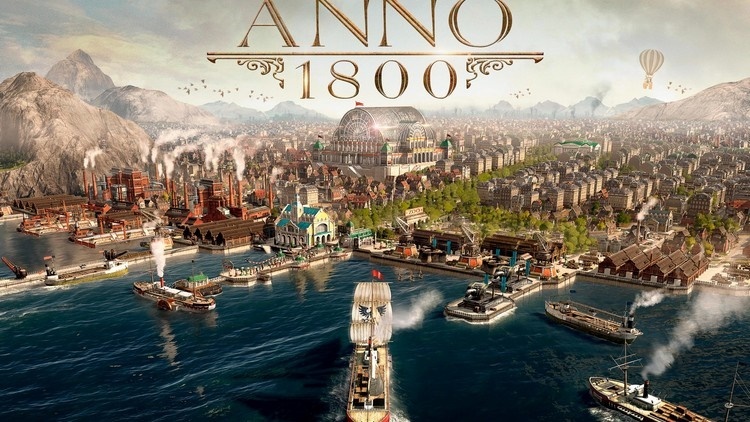 Certainly not for the casual fan, Anno 1800 is a glorious exploration of a glorious age. It is a technical achievement for strategy gaming that goes unrivaled, and while its complexity may be a roadblock for some, the return on your investment would make even the greediest fat cat smile. Nevertheless, Anno 1800 paints a gorgeous, idealised picture of the industrial age. It saturates you in the glory days of empire from way on high without getting its fingers too dirty, and propels you through the era, eager to showcase its many curiosities and machinery, step-by-inevitable-step. It’s a triumph of presentation, and the decision to reintroduce rivals to play against breathes character and replayability into a series that had been going stale with its cold, lonesome outings. Anno 1800 is no Industrial Revolution, but it’s certainly on the path to progress. If there's one thing I dislike with the game it's the feeling of being a complete classist shitlord exploiting people and colonizing indigenous peoples' land, but it's also to its credit how accurately it portrays it from a historical viewpoint. I also dislike the fact that the prison requests buying Soap... boring toxic masculinity "joke" in 2019. Bleh. Considering these sorts of things are what I'm complaining about speaks volumes about the quality of the game in general. Blueprint mode is a godsend. Brilliant idea, especially in a game like Anno where I want everything to be straight and orderly.. haha. I've been aware of this games existence for 3 days now and I'm can't wait for tomorrow. Even bought a new laptop for it ! i played the open beta and honestly, it was the most fun i had in ages. Seems low for what seems like one of the best Anno games ever made. But I am talking out of my German bubble. This. Everything under 90 is not right imo. Gonna have to wait for next paycheck but gonna get this for sure, the future Anno had some nice idea's but was packaged kinda weirdly. This seems like a return to form with a bunch of new additions which I'm totally down for. Reviews are positive, but not as glowing as I expected. They are giving weight too much on presentation, games like the X-Series (beyond the frontier) always reviews badly (in the 60 to 70 range) just because it looks like an excel spreadsheet, even while the audience devours it for hundreds/thousands of hours. That's why we need User Reviews. It is for another couple of hours. Why not just buy it on uplay? It launches to uplay anyway. Hell, if you are in Europe and have those uplay coins you can get 20% off. Same here. I'm really curious, though, because the future scenario of the last two ones was just not for me. The Gamestar review mentions a lot of problems for a 89, which makes me a little cautious. On the other hand, they say the endgame is brilliant. I’ve started playing Anno 2205 literally yesterday. While I’m having fun, I’m pretty sure I’ll enjoy the classical setting way more than the futuristic one. Can’t wait to play this eventually. I hope AMD is going to release optimized drivers before launch. Performance is rough right now even on i7 8700k and Vega 64 GPU. Don't care too much about the scores. They all gave RDR2 a flawless 10 and I quit that game halfway through. Ah right, forgot you could still preorder it there. Unfortunately 60€ is a little too much for me, I was hoping to buy it on sale later. Pretty solid game, gonna play it until my eyes bleed. I'm so glad this one is reviewing well! Will be keeping an eye open for performance updates though before jumping in. I’ve been watching some YouTube videos and the graphics seem... lacking? Even searched for max settings videos but definitely not impressed. I also expected higher reviews but from what I played during the beta over the weekend this game is just incredibly addictive. I wondered about the notice that I was already playing for a prolonged time :). Really? What building game looks better? OMG I read that you can get into 1st person by clicking Shift + Ctrl + R. That would be awesome if true. Can´t wait to get back into the game. After playing the open beta, game was pre-ordered. My first Anno and am looking forward to diving in. Haven't sunk time into a game of this type in quite a while. I almost skipped the beta due to laziness, what a mistake it would have been. Fortunately I randomly installed it yesterday and I had so much fun, it sparked memories of 1404. Can’t wait for tomorrow. Glad to see the initial reviews are good. You're very welcome, the game looks absolutely stunning ! Even the older Anno's looked fantastic, this one looks amazing as well. Not sure how you can think it seems lacking. Seems like the open beta was pretty successful then right? Reading a ton of posts about how it sold them on the game. Chuck me in that category too. Only played an hour of the beta but yea made me happy with my preorder. Look forward to putting some actual time into it this week. Good reviews! Pre-ordered on Steam. Game is getting robbed. This is the definitive Anno experience. I really hope this does well. Kudos to the devs for bringing Anno back and finally dethroning 1404. I wasn’t in a great financial position to get this now, but I had to pick up the Steam copy before it was too late. I played the beta and thought it was incredible (never played Anno before and now I think I might’ve missed out). It was a little taxing on my hardware at the highest settings but it ran at acceptable framerates all the same. I immediately pre-ordered on GMG while the 15% discount is good for the next half day or so. I love what I'm seeing but alas, my poor Surface Pro :( Would love to snag it if/when it comes to the consoles. Looks like a fantastic entry, kudos to the team. Beta was great, glad the reviews are good, pre-ordered on Steam! I played the beta yesterday and I loved it so much. I can't afford it right now, but the game looks stunning, and the gameplay is amazing. Can’t wait to get off work tomorrow and play this. The beta hooked me big time. IGN Benelux has given the game a 9/10. Closed beta sold me the game, can't wait for tomorrow! Great reviews. True but that's not how it reads for most consumers, unfortunately. People seeing the scores will just jot it down as "oh the game is average so I'll play something else" which is laughable. Edge is the only publication I consistently trust with review scores, personally. I played a bit of Anno 1404 today again and there's honestly no comparison. 1800 just feels better in every possible way. The requirement to not simply phase out earlier citizen classes and also requiring people to actually live on the islands they produce goods on makes the game much deeper and more challenging in a natural manner. When does the game unlock btw? Hoping there's a Denuvo crack soon after launch as well... my 2500K feels really limiting in a game like this nowadays and I bet I'd get 10-20% better performance without the DRM garbage. I am so excited for this game. I've been looking for a city builder or 4x or whatever game for months now. I had never looked at Anno before and immediately fell in love with the beta. Can anyone tell me how the multiplayer works? My friend and I are looking for a co-op-y game and we really enjoyed our time with games like Civilization, where we work together in a broad sense but still do our own thing. Would this kind of scratch the same itch? I wouldn't worry about a crack, the game hits my Ryzen 7 at like 20% on one core. Don't know how it will work in 1800, but in previous Anno games you could play against each other, or co op against AI's. You both have your own island and do your own thing. Do feel the absence of ground combat could limit the multiplayer aspect of it a little bit. But it was never a strong point (the contrary) of the games.